Unlike the Sony VAIO Duo 11 where you can install the programs you run on an ordinary computer system, here you are limited only to Windows RT software. amsung Ativ tab is one of the members of the brand’s ATIV family that also includes the ATIV S smartphone – we already showed you in a video review, and the other one is an ATIV smart PC. But now let’s take a closer look at the tablet. The body is slim and thin only 6.61 inches tall, 10.46 inches wide and 0.35 inches thick. The design stands out with the unique and interesting metallic hairline glossy finish on its plastic backside. For the tablet’s impressive appearance also contribute the curved lines, elegant shape and the lightweight of 1.2 pounds. The 10.1’’ PLS LCD display is bright – which definitely facilitates the work process outdoors. The wide viewing angle along with the vivid details and rich colors provide a wonderful viewing experience in 1366×768 pixel resolution. The pixel density is of 155 pixels per pinch, not very impressive, right? There are a few peculiarities concerning the software of the ATIV tab and I would like to pay more attention to them because personally I regard them as disadvantages. At first glance I bet you will say that it runs Windows 8 but no, the platform that runs on this tablet is Windows RT. I know looks exactly like Windows 8 to you, but there are a few very considerable differences between them. First of all, the Windows RT version is designed to be in accordance with computer processors with ARM architecture. Unlike the Sony VAIO Duo 11 where you can install the programs you run on an ordinary computer system, here you cannot run Legacy Windows software so are limited only to Windows RT software. The processor that runs this operating system is a dual-core Qualcomm Snapdragon S4 at 1.5GHz. The RAM is 2GB and the built-in storage 32GB, but the SD card slot, however, can increase it with 64GB more. The base camera is a 5MP rear-facing one with automatic focusing and an LED flash. However, when we took portrait pictures in low lighting using the flash the light was too strong and bright. We were not pleased with the performance of the camera in dark conditions. The camera records good-quality video in HD in 1280×720 resolution, the LED flash can be active while you shoot the video. The front camera is a 1.9MP VT one and does a decent job for video calling. 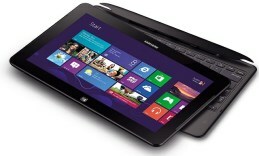 The Ativ tab connects to other devices easily through variety of ports there is a microUSB and a microHDMI port which are hidden along the smooth periphery edges. NFC connection technology is also available as well as the Bluetooth v4.0. On the bottom edge there is dock connector for the times when you need an actual keyboard. The battery of the Samsung Ativ tab is a 8200mAh Li-Ion one and guarantees around 7 hours of intense browsing.